The Glenlivet, by being the first licensed distillery in the valley, set the standards in quality and taste that went on to define the Speyside style of single malt whisky: Smooth, Rich and Fruity. This whisky pays tribute to the original vision of The Glenlivet’s founder, George Smith: to create a smooth and timeless single malt. 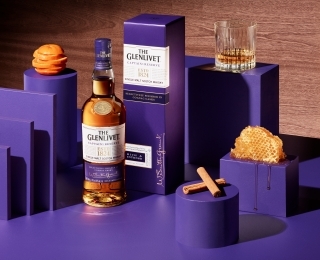 It offers a fruity character typically associated with The Glenlivet and a delicate aroma of citrus and a creamy sweetness to seduce the senses. An echo of George Smith’s original classic with notes of pineapple. Aged in a variety of oak casks to impart smooth, vanilla notes. The Master Distiller’s Reserve range is a collection of exceptional single malt whiskies that marries the craft of the cask and the skill of the Master Distiller to create the ultimate flavour experience. This range is available as a Duty Free exclusive. This is a spicier version of the original classic with a touch of smoothness. The spirit gets its distinctive rich and exotic character from a process of selective maturation in which a proportion of the spirit is matured in French oak casks. The Glenlivet owes its unique taste to a number of specific factors relating to its production and location. The distillery is located in the Cairngorms National Park at over 270m above sea level. According to weather records, it is one of the coldest places in Britain characterised by strong winds and heavy snowfalls in winter. The water drawn from Josie’s Well, a source of hard mineral water, enables complex aromas to develop during the distillation process. The lantern-shaped stills give the spirit its outstanding balance and strong character. Lastly, a careful ageing process, using hand-selected oak casks, gives The Glenlivet its full flavour. Founded by George Smith, The Glenlivet has been crafted in the remote Livet Valley in the heart of Scotland's Speyside region since 1824. He founded the first legal distillery in the parish of Glenlivet. George Smith died in 1871, but his legacy lived on in his son and heir to the distillery, John Gordon Smith, just as much as it did in the spirit in the casks. In 1876 John filed a request to trademark the name Glenlivet to put an end to the activities of the impostors taking advantage of the desirability of the single malt by using its name on their bottles. In 1884, a legal agreement officially gave George Smith's single malt the exclusive right to be called The Glenlivet. At the start of the 20th century, The Glenlivet became the favourite whisky for enthusiasts throughout the British Empire. 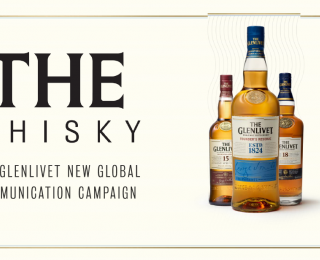 Following the end of Prohibition in the United States, its reputation grew in America with The Glenlivet quickly becoming the No.1 single malt in the country, a position it continues to enjoy today.